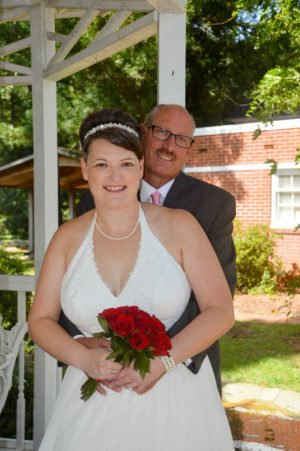 Aimee Elizabeth Justice the daughter of Daniel E. Sherrill of North Myrtle Beach, SC and Harry Victor Grubb, Jr. the son of Harry V. and Linda M. Grubb Sr. of Manning, SC were united in marriage on September 17, 2016 at Wedding Chapel by the Sea, in Myrtle Beach, South Carolina. Rev. Pam Muise officiated. The bride’s attendants included: the daughter of the Groom, Sarah Grubb and the daughter of the Bride, Reagan Justice. The Groom’s best-man was Todd Miller of Summerton, SC. A reception at the Wedding Chapel by the Sea followed the ceremony. The couple honeymooned in Pigeon Forge, TN. The couple will reside in Florence, SC.